I wonder why #25 was closed. The bundle is not recognized and it's never listed in the plugins screen. I'm running 3.5.6 (481) on macOS 10.13.4. Same here... two years and still no fix? Airmail doesn't care for your privacy. Simple as that. Not good, the fact that the app doesn't inform you that the plugins are disabled in the most recent build and silently fails is really not ideal. Any idea when this will be fixed as given the current attitude of the internet where encryption and data security is concerned, it may take moving to another mail client. A version with fix is in approval by App Store is just taking longer then usual. 3.6.43 came to me today and the plugin is still not visible. The GPG worked before. When I recover the app from Time Machine - it does not see any of the plugins. Yeah but that error is something to work with. It's a dependency incompatibility. It might be possible to build a new version of the framework it depends on or something like that. @Lord-Kamina: I had tried to build with XCode 10.0 (10A255) and have the same problem..
Let me make an analogy... I'm telling you "Your car won't start because it's missing a fuse." and you just replied "That cannot possibly be the issue, I just painted it a new color today." The plugin needs Libmacgpg.framework (https://github.com/GPGTools/Libmacgpg) which was presumably shipped at some point but no longer or something like that. I did a checkout of this repo. It has a submodule of Libmacgpg.framework as a dependency (but some outdated commit). I checked that out as well. After that I tried to build with the submodule-commit, then with the latest master branch. Nothing.. Maybe there is a trick in the XCode Project configuration? 2018-10-21 17:19:19.226 Airmail Beta[95582:1980691] [INFO] Loaded Plugin Read Receipt This plug-in implements a Read Receipt system. Where are you all placing Libmacgpg.framework? @Lord-Kamina GPG Suite installed it to /Library/Frameworks/Libmacgpg.framework for me (I assume this is the default - I've done nothing to suggest otherwise). @Lord-Kamina, I have GPG Suite in /Library/Frameworks/Libmacgpg.framework as well. drwxr-xr-x   6 root  wheel  192 21 жов 00:22 .
drwxr-xr-x  12 root  wheel  384 21 жов 00:22 ..
drwxr-xr-x  4 root  wheel  128 21 жов 00:22 .
drwxr-xr-x  6 root  wheel  192 21 жов 00:22 ..
drwxr-xr-x   6 root  wheel     192 21 вер 02:03 .
drwxr-xr-x   4 root  wheel     128 21 жов 00:22 .. Rebuilding this plugin seems to help. @rogerwalczak, I wonder what the steps were done in order to do the build? I tried to build on Mojave and caught the same error. Although probably a better solution would be to bundle Libmacgpg.framework with the plug-in and add proper rpaths to the executable. Also, Libmacgpg apparently uses ObjC GC, which was deprecated ages ago. I tried converting it on my machine to ARC but I think my Xcode might be broken and it didn't work. Mojave build: 1. Build recent version of Libmacgpg.framework 2. Open AMPGpg.xcodeproj in Xcode (don’t make ARC conversion) 3. Remove reference to Libmacgpg.xcodeproj from project 4. Copy Libmacgpg.framework and AMPluginFramework.framework to project folder. 5. Remove references to AMPluginFramework.framework and Libmacgpg.framework and add them again indicating just copied frameworks 6. Build. Build will fail on post processing step - copying bundle file to non existent directory (at least in my case. Didn’t bother to fix it) - but you will find the file in ~/Library/Developer/…. (Long path) -- R On 23 October 2018 at 22:19:48, Andrey Miroshnichenko (notifications@github.com) wrote: @rogerwalczak, I wonder what the steps were done in order to do the build? I tried to build on Mojave and caught the same error. — You are receiving this because you were mentioned. Reply to this email directly, view it on GitHub, or mute the thread. objc: Class SSKeychain is implemented in both /System/Library/PrivateFrameworks/StoreServices.framework/Versions/A/StoreServices (0x7fff9d55ab18) and /Applications/Airmail 3.app/Contents/Frameworks/EvernoteSDK-Mac.framework/Versions/A/EvernoteSDK-Mac (0x104c9bc68). One of the two will be used. Which one is undefined. The file from @rogerwalczak works though. I second this wholeheartedly. And when I think about gpg support in both desktop and mobile version … hmm … killer feature indeed. On 5 Nov 2018, at 16:47, Adam Ierymenko ***@***. ***> wrote: Why not build GPG support into Airmail? It would be fine to make it a more expert option that the user must enable. Just look for 'gpg' in /usr/bin and /usr/local/bin and also provide an option to input the location of the GPG binary. Most GPG users install via Homebrew, which puts it in /usr/local/bin. This would really be a killer feature. — You are receiving this because you were mentioned. Reply to this email directly, view it on GitHub <#34 (comment)>, or mute the thread <https://github.com/notifications/unsubscribe-auth/AMyYeipd8P-U_PAREBSZNGkYlPECB-Jlks5usF2egaJpZM4UWLRS>. I was able to get the plugin working again by rebuilding it from master (following this suggestion from @rogerwalczak). I actually only had to copy Libmacgpg.framework (and remove references to the Libmacgpg.framework). Looks like that's semi working for me. I'm having an issue with the encryption option on this, not sure if anyone else is. I can sign email, but even if a recipients public key is in my keychain, I can't select encryption. I can however select to encrypt the mail if I select an email address for which I have the secret key, such as another email address I control. @yannickmcosta same -- i can (1) decrypt emails (2) reply encrypted to anyone (3) only compose encrypted to myself. @Bloophub is this on the airmail side of things or the plugin? Appreciate your thoughts. I believe the PGP plugin in Airmail has a lot of problems, actually. To be honest this makes me quite sad, because Airmail is such a nice emails client, but the fact that the PGP plugin is so badly maintained and supported is quite a problem. As a developer I would be happy to help fix it and take up maintaining it (and I bet other devs in this thread would also be glad to lend a hand), yet this cannot happen unless there is some better interaction with your community. Open source is not just about putting the code out there, it's also being available to help devs help you! Need to re-sign to GitHub to comment on this issue. That's why I brought Airmail in terms of a much better UI and app feeling. But need urgently PGP support. I am using mail mostly for business, and would like to keep certain communication encrypted. I am not a developer at all. But I'd pay 50USD if some one writes a serious working plug-in! @sgcoffee - the zip from this comment above works for me with the latest Airmail on latest High Sierra. @zentavr - Thank you. The plugin gets recognized now, but only PGP signing is possible. GPG Keychain is running. Apple Mail doesn't have any issues. Ok, I could decrypt one older mail for one mail account, which I tried at first. But I couldn't answer encrypted. Nor send an encrypted new mail to this recipient. I even tried another old encrypted mail from another account. Didn't work. I guess, why it doesn't work: I don't get the option to enter the passphrase. It did at the first account. There is a another problem. Attachments and inline graphics in every mail, don't get shown at all, if the plug-in is active. Deactivating the plug-in restores images again. That's an annoying bug. Still having issues getting Airmail to find the plugin. Was hoping this might get resolved with Mojave. I can't use and can't recommend AirMail if it doesn't work with GPG (and I suppose bigger point, doesn't work with one of its own advertised plugins). 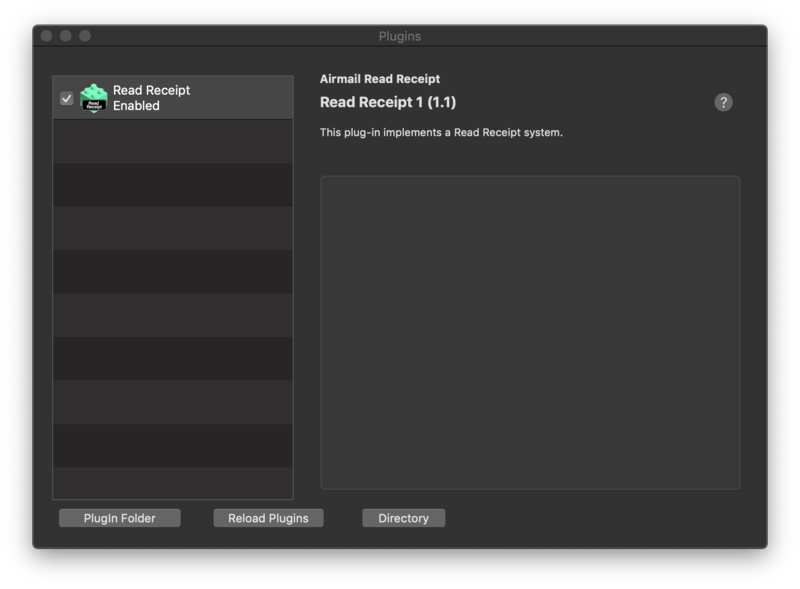 Pre-Mojave, AirMail saw the plugin, but it couldn't unencrypt attachments. Now, it doesn't even recognize the plugin, same as the user above. I still have this issue with version 3.6.58 (546). Build attached by @y3sh used to work for me but not after last Airmail update. @y3sh would you be so kind and prepare updated build maybe? @kiela Sure... here's a new build, but it seems only decrypt is working for me. @KodaKoder regardless of what airmail does right now, there are concerning parts of the policy. Consider recommending airmail for corporate adoption. These policies conflict with most corporate policies regarding sensitive data. Bloop S.r.l cannot guarantee the security of Personal Information. Unauthorized entry or use, hardware or software failure, and other factors, may compromise the security of user information at any time. Where are the macos and ios policies? @y3sh I can confirm this as well. The only thing that seems to work is the signing of emails. OK, now. Can anyone from the Airmail Team tell, WHEN the plugin will be recognised? Thanks to y3sh, with his build at least signing emails is possible. However, I need encryption. Yes, you have my money, but I cannot recommend it (although the rest works fine). I would stop using it, if I cannot get a date when this bug will be fixed!! 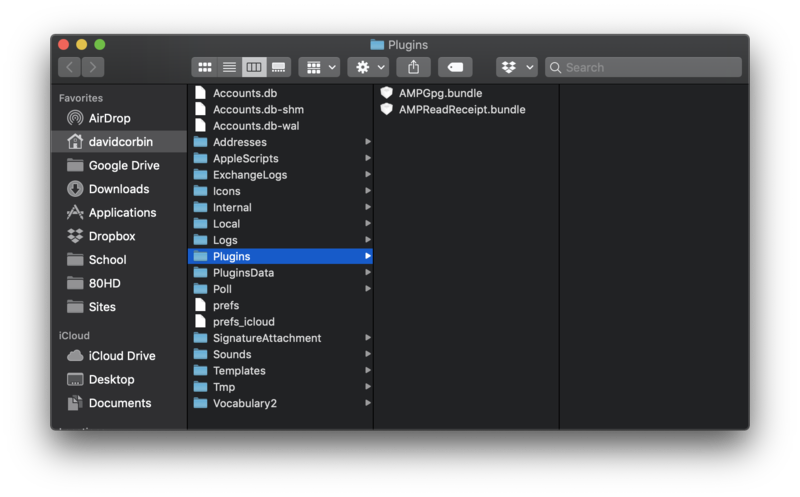 there are some news about this in upcoming WWDC and we will revise the plugins.